A few weeks ago, I was really craving a sweet bread with them and just couln’t get it out of my head. I figured that if I was the only one who liked it, that would be ok and I’d just eat the whole thing. So, I started searching the internet for a recipe and could only find corn breads and dinner breads with them. 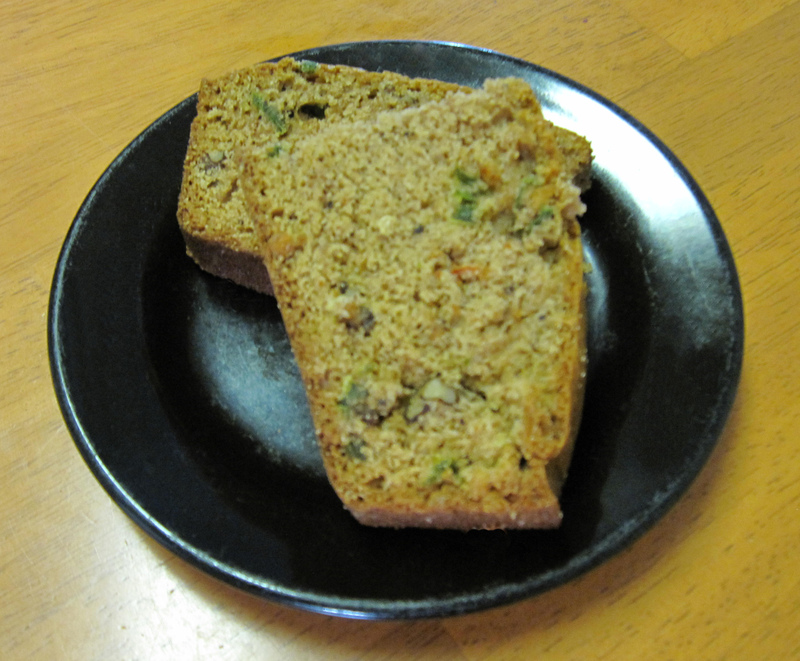 I decided to use a recipe for zuchinni bread that I liked and just switch out the zuchinni for jalapeno. It worked out so well that although I doubled the recipe, it was 2/3 gone in only 2 days. My family loved it and so did I. I had to alter only a few things from the zuchinni recipe and have revised the new one a little more to make it even better. The bread is sweet and just a little bit spicy. There is a nice balance of the two. I hope you make it too and enjoy it. In a mixing bowl sift together the flour, cinnamon, baking soda, salt, nutmeg and baking powder. Set aside. In a large mixing bowl beat together sugar, sliced jalapenos and an egg. Add oil and mix together well. Stir flour mixture into the jalapeno mixture. Add in the milk and stir together. Fold in the chopped walnuts. Grease an 8 x 4 x 2 inch loaf pan with butter and bake in the oven at 350 degrees for 50 minutes. (Or until a knife inserted into the center comes out clean.) Makes 1 loaf. 6 servings.